2014-2015 - St. Lachteens N.S. We have been busy during the summer holidays renovating classrooms, the three original classrooms built in 1948 have been redesigned and renovated into two spacious class areas. Soon we will also be embarking on a new school extension which will incorporate a classroom, disabled toilet area and a new office. We are delighted to be starting this project. St Lachteens is a great school, with great staff and has fantastic support from parents, Board of Management, Parents Council and the wider school community. These extra facilities can only further help to match the quality of the learning and teaching that occurs within the school. We apologise for any inconvenience the construction works may cause, but please bear with us while we make our school building an even better place to be. Congratulations to all the children throughout the school and staff who helped with our school garden this year. In St .Lachteens we have an edible garden with potatoes, cabbages, lettuce, cauliflowers, beans, chives, coriander, thyme, strawberries, blackcurrants, rhubarb and blueberries. We love to learn about how things grow. We like to use the food in cookery, first class made lovely rhubarb crumble yummy! Second class measured the beans as they grew. Senior Infants kept a close eye on what was growing and on the pesky slugs! Fifth and Sixth class propagated seeds. 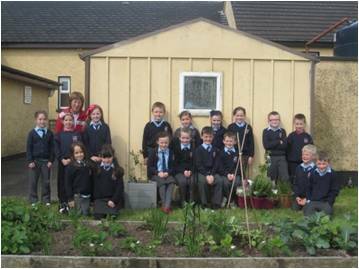 This year we entered the Muintir Na Tíre school garden competition, we found out just before the summer holidays that we had won 75euro to be used for the garden and got a certificate of commendation, we are delighted and are already wondering what we will plant for next year! Our sixth class are enjoying their last week of primary school. They have been a pleasure to teach and we will all miss them next year. They are looking forward to their Graduation Mass tomorrow, Tuesday at 10.30am in St. Lachteens Church. Afterwards, they will perform a medley of songs for their parents in the Community Centre, they have been busy composing and practicing a special song for the occasion - we can't wait to hear it! 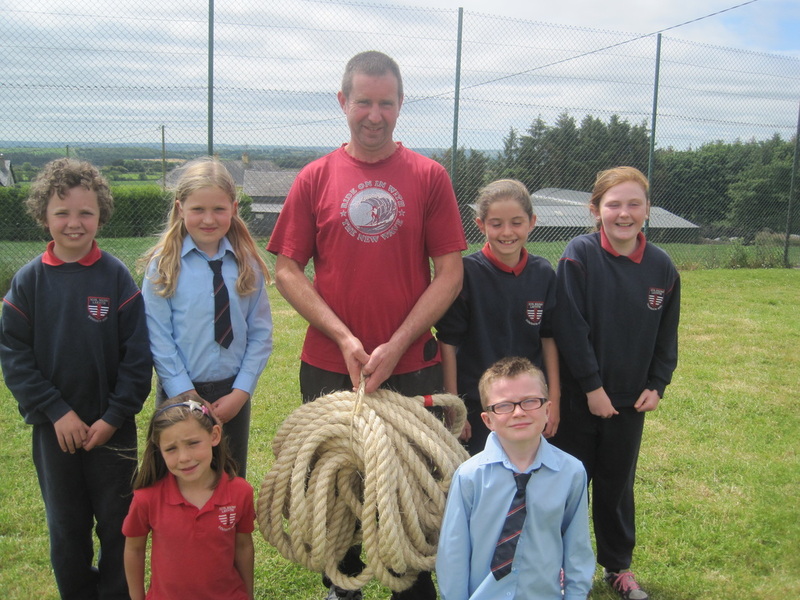 Go raibh míle maith agat to Sean Honohan of Donoughmore Tug of War who presented our school with a primary tug of war rope. The pupils had great fun with it on sports day. A fabulous day was had by all on our sports day. All the children engaged in a range of activities from games to three legged races, egg and spoon races, sack races, long pucks and penalty shoot outs. We all got a great surprise when the ice-cream van arrived. We jumped for joy when we heard the music and we all loved the treat! After lunch fifth and sixth class put on a talent show for us and we were entertained with fabulous singing, amazing hurling skills and even a magic show. We're looking forward to next year already! 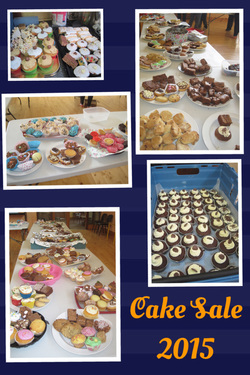 Delicious home made treats made their way to our hall today for our annual Cake Sale. Thanks to all who baked, bought and helped to sell the fabulous home baking. Enjoy your cakes! Huge congratulations to the boys in fifth and sixth class on their hurling victory. The boys won the Duhallow Hurling League Final.They played an outstanding game against Kilbrin in Rathcoole. Their captain Donnchadh Morrissey gave a fabulous speech and was delighted to be presented with a shield which will be kept in the school for the coming year. Well done to all involved! 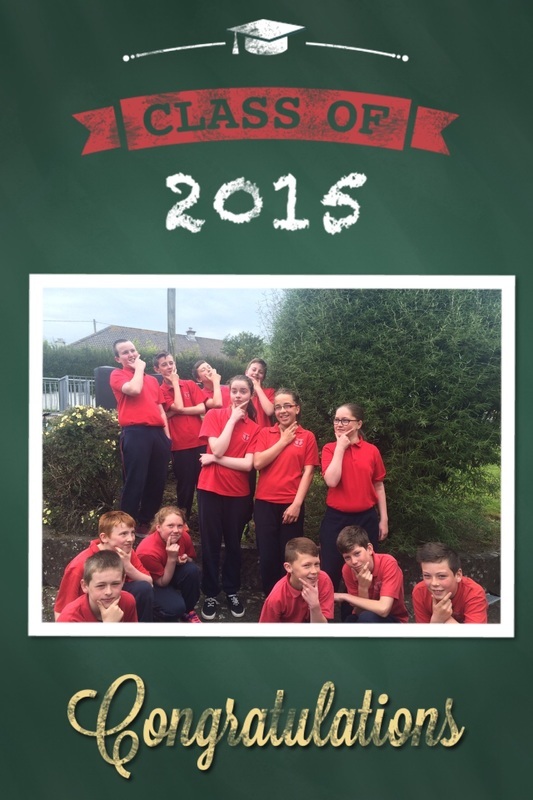 Our end of year magazine has arrived and is available to purchase for €2 from the school. This years sixth class put a lot of work into writing all the articles and are very proud of the final product. The pupils from second, third, fourth, fifth and sixth class have spent weeks practicing poems and a selection of songs. They were delighted to welcome the examiner Mr. Hopley to our school with our drama teacher Mrs. Ring. We think he really enjoyed all our performances on the day! The boys left school at 8:50 and even though traffic was extremely heavy, we were in the stand in plenty of time. We waited in the stand for our section to be called. Once we were called to the assembly area, we lined up according to our age group and waited for the races to start. All the boys ran really well. Paddy Murphy came 2nd in the boys U7 race and David McDonnell came 3rd in the 9-10 race. On next to the relays. The relays took place on the running track. Dan, Donnchadh, Aidan and Dean were unlucky in the over 11 relay. Frankie, Ronan, Diarmuid and Alex ran a great race and placed third. Time for the boys to go home. At lunch time the girls travelled in to C.I.T. By this time it was very hot and we were all glad to have a sheltered spot in the stand, we sipped water to stay hydrated. At last our section was called and like the boys we lined up in our age groups and waited. Before we knew it the races were all over. All the girls ran great races, Niamh Twomey came 3rd in the U7 race, Maria Murphy came 3rd in the 10-11 race, Amy Ring came 2nd in the 12-13 race and Orla came 1st in the 9-10 race. Orla would represent St. Lachteen’s in the County later in the day. Time for the relays. Kelly, Rachel Walsh, Maria and Rachel McCarthy had a bit of bad luck in the U11 relay but still ran a great race. Amy, Maeve, Megan and Mary Ellen were just outside the trophies in the Over 11 race. It was time for the bus to go home. Orla remained with dad and Mrs. O’ Hanlon. Orla came 3rd in her semi and as two qualified for the final she didn’t make it this time. Well done to Orla on achieving first in her section, It is a great achievement to win your section. 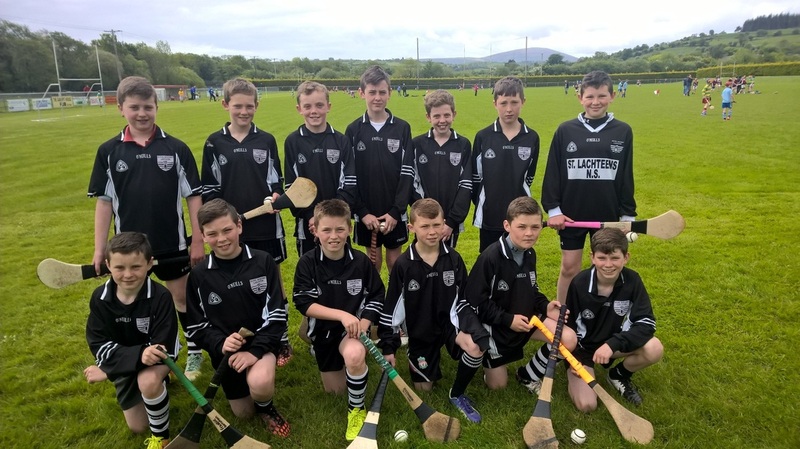 Boys: Paddy Murphy, Charlie Reardon, Daniel Walsh, Billy Bell, David McDonnell, Oisín Brew Dinan, Darragh Lawton, Diarmuid Kelleher, Ronan Crowley, Alex Bruton, Frankie Honohan, Dean Browne, Adam Dinan, Donnchadh Morrissey, Aidan Walsh and Dan Ring. Girls: Niamh Twomey, Laura Twomey, Clíodhna McNamara, Naomi Kelly, Orla Kelleher, Leah Geaney, Rachel McCarthy, Rachel Walsh, Maria Murphy, Kelly Honohan, Caoimhe McSweeney, Mary Ellen Corkery, Amy Ring, Maeve Barrett, Fiona Looney and Megan Bermingham. Children in First Class had a great time on their Toy Picnic . Children brought in their favourite toy and brought them to the local playground where they had a picnic and had lots of fun playing. Fifth and sixth class were delighted to receive a certificate in the post for their participation in the "Sow and Grow Project". They have brought their courgettes and pumpkins home and are ready for the transplanting stage. They are looking forward to harvesting them in the coming months. A fabulous day was had by all pupils from third to sixth on their school tour to Trabolgan. The pupils enjoyed the Zip Wire, Go - Karting, Combat Laser and Swimming. Well done to the boys from fifth and sixth class on their incredible performance in the Duhallow Hurling Blitz. The boys won all their matches on the day and are really looking forward to the final. We are all very proud! Garda Orla Doyle visited our school today. She spoke to us about personal safety. We discussed road safety, water safety, internet safety, farm safety and what to do in an emergency. She also told us about her job as a Garda. She was very kind and helpful. We really enjoyed her visit, thank you for coming to our school! Over the last few weeks in fifth and sixth class we have been carefully monitoring our plants and have been seeing great increases in their growth. For example our courgettes have gone from seedlings to sproutlings and our pumpkins have grown a great deal. We are almost ready to transplant the courgettes and pumpkins to bigger pots and the cress is ready to harvest. We have learned that cress grows towards the light. We have enjoyed the anticipation of watching and waiting for our plants to grow. We can't wait to harvest our plants and so far we have thoroughly enjoyed the experience of planting and growing our own plants. We are delighted to have received our Active Flag. Pupils in this school are always very busy engaging in many sports and physical education activities. Thank you to our special guest Tim Joe Buckley and his wife Ann who joined us to raise our flag. Well done to the Active Schools Committee and Ms. Murphy. Congratulations to Maeve and Amy, whose entry for The World Book Day Competition resulted in the school receiving a wonderful set of books. The school are very proud. Well Done to the pupils in fifth and sixth class who decorated two fantastic Easter Eggs and the pupils in second class who decorated two amazing Easter Bunnies. These will be displayed over Easter in Mahon Point Shopping Centre. Well done to pupils from fifth and sixth class who represented our school and showcased their talents in the "X Factor Talent Competition" in Scoil Mhuire Gan Smál, Blarney. Congratulations to all pupils from third to sixth class who participated in our internal basketball league. Rena Buckley, Frankie Honohan and Martin Geaney visited our school with the Brendan Martin Cup and the O' Duffy Cup. We were delighted to see them and we all wore red for the day! Congratulations to our u11 quiz team who won their regional round and represented our school in the county round of the credit union quiz. We are very proud of them! A truly enjoyable night was had by all at our school pageant. Well done to all the children who sang beautifully on the night. A big thank you to Mrs. Ring our drama teacher for all her hard work. Fifth and sixth class had great fun decorating their Christmas logs and came up with very imaginative creations. Second class generously donated to the St. Vincent De Paul Christmas Shoebox Appeal. Santa took time out of his very busy schedule to visit us all, we were very excited when we heard his bell ringing along the school corridor! Congratuations to the pupils from fifth and sixth class Maeve, Amy, Aidan and Jasmine who came second in the IRD Duhallow Public Speaking Competition. All the class worked very hard to prepare the speeches and they enjoyed discussing the topics in school. They presented their speeches fabulously on the night and we are all very proud of them. First and Second Class recently participated in an initiative with Eileen from the Mater Private where they learned the correct technique for washing their hands. The best part was checking their hands under the special light to make sure they were spotless. A great night was had by all at the recent fundraiser organised by the Parents Association. The community centre was decorated and transformed for the night. Thank you to all who organised the night, hosted tables and attended this very enjoyable event. As part of our healthy eating policy in our school all children are encouraged to bring fruit and vegetables as part of their lunches. We recently participated in the "Food Dudes Programme" and we got lots of fruit and vegetables delivered to our school. After we tasted the fruit and vegetables we got some very good prizes. We are now bringing in fruit and vegetables as part of our lunches each day to get some more prizes. Joanann Kelleher from the RSA recently visited our school. She spoke to all pupils about the importance of road safety while walking, travelling by car or bus and cycling. She reminded us of lots of very important rules that we must remember to keep safe. Thank You Joanann.